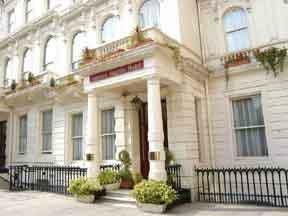 This property is located at 144 Praed Street in Greater London. Check room availability using the search box on your right. The Mercure couldn’t be any closer to Paddington Central than if you had stuck a platform number on reception and put live departure boards in the hotel bedrooms. It’s not one of the cheapest options here by any means but the current online deals and discounts can slash the standard £400+ price tag by as much as 730%. Standing next door to the Tube and Rail Stations on Winsland Mews this sophisticated and über stylish boutique hotel is just two minutes from boarding the Heathrow Express and offers a bevy of four-star perks including an onsite Garfunkel’s Restaurant, free fitness facilities, wide screen LCD televisions and "Mercure and Me" toiletries.